As the story is told, Johnny Carson, (1925 to 2005) the late late-night comedy host, was practicing serving tennis balls. Bystanders watching were disappointed. He was the genius comic star on The Tonight Show Starring Johnny Carson from 1962 to 1992. Since he dominated TV everyone assumed that he would dominate in any venue. No. But Carson thought he was a star player. He wasn’t. He was an average-talent tennis player who may not have known it–even if his fans did. There is also this hubris in business where CEOs have an expertise in one field and think that they can do anything in any business. Dunkin’ Donuts was established in the early 1950’s and was soon opening a new store every month. William Rosenberg was the founder and became an expert in the franchise model as a channel of distribution for the Dunkin’ Donuts brand. Just as Johnny Carson was with tennis, William Rosenberg thought he could do everything with the Dunkin’ Donuts template. If Rosenberg could manage franchising for donuts he thought he could franchise any food item–transferable skills and all that. Rosenberg moved into fast food hamburgers with drive through service. He delivered food to customers via vending machines. He offered food for large institutions. He even dabbled in that British fast-convenient national food, fish and chips. These new businesses were not simple line extensions but a wholesale departure from the retail company line: Coffee and Donuts for dunkin’. Rosenberg was not expert in all products and services and mediums. We have different gifts, according to the grace given to each of us. Romans 12:6. He thought his business was building franchise organizations – which would have been a most interesting consulting business opportunity. However, Rosenberg’s management talent was diffused as he attempted to run different businesses. They began to lose money as he lost focus. Rosenberg wisely sold off all the diversions and devoted all his resources back to the core business of Dunkin’ Donuts. He passed away in 2002. 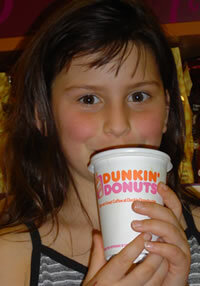 Dunkin’ Donuts’ sales were $6 billion in 2010 with 15,000 restaurants in 37 countries and soon earned the No. 1 ranking for customer loyalty in the coffee category. Rosenberg’s legacy now sells more than donuts in common-sense line-extensions. The fast food items are bagels and breakfast sandwiches. But only through the Dunkin’ Donuts franchise.